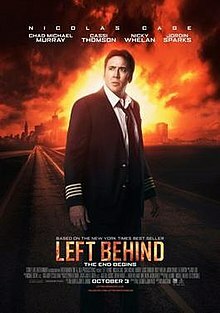 For the original film (first adaptation of the novel), see Left Behind: The Movie. Left Behind is a 2014 American apocalyptic thriller film directed by Vic Armstrong and written by Paul LaLonde and John Patus. Based on the novel of the same name written by Tim LaHaye and Jerry B. Jenkins, and starring Nicolas Cage, Chad Michael Murray, Cassi Thomson, Nicky Whelan, and Jordin Sparks, the film was released to theaters on October 3, 2014, and was universally panned by critics. It is the second film adaptation of the first Left Behind novel, though it does not follow the book's chronology. University of Central Arkansas student Chloe Steele has flown in from college to surprise her father, pilot Rayford Steele, for his birthday party. However, her mother Irene quickly calls to inform her that her father cannot make it. While at the airport waiting for him, Chloe meets up with investigative reporter Cameron "Buck" Williams. Rayford shows up on his way to a flight and apologizes to Chloe for missing his birthday party, insisting he was called in to pilot a flight to London at the last minute. He also assures Chloe things are fine between himself and his wife, who recently had become an active believing Christian, much to Chloe's chagrin. Chloe suspects things are not fine between her father and mother – she had seen him flirting with flight attendant Hattie Durham and notices he has removed his wedding ring. Her suspicions soon are confirmed when an airport worker hands Chloe two hard-to-get U2 concert tickets in London that Rayford had ordered, indicating his trip to London and possible extramarital fling was planned all along. Chloe brushes off another one of her mother's preachings about Christianity and takes her brother to the mall. While there, her brother suddenly vanishes, leaving only his clothes behind. Chloe is shocked and notices this same thing has happened to numerous others at the mall. Mayhem breaks loose as shoppers begin looting the stores. A driver-less car plows through the mall windows, and a small plane without a pilot crashes in the mall parking lot. Chloe sees television reports of children and some adults disappearing, as worldwide panic sets in. On Rayford's flight, the same strange event has occurred – several people, including his co-pilot Chris Smith, Kimmy, one of the flight attendants, and all the children on board, have simply disappeared, leaving their clothing and personal effects behind. The remaining passengers panic and demand answers. Rayford does his best to reassure the passengers he will pass on information once he has any. Rayford has difficulty getting radio or satellite phone contact with anyone on the ground, until he is finally informed that people have disappeared everywhere and the world is in uproar. Soon a pilot-less jet approaches directly into Rayford's flight path. He narrowly avoids a midair collision, but the jet damages Rayford's fuel line. He decides his only option is to return to New York and hope his fuel holds out. On the ground, Chloe hears her father's mayday call on her cell phone and assumes his plane has crashed. She later finds her mother's jewelry left behind in the shower, as she has also disappeared. Chloe makes her way to New Hope Village Church to discover family pastor Bruce Barnes, who explains God has taken his believers to heaven, and the rest have to face the end of days. The pastor explains he was not taken because he did not really believe what he had preached. Rayford comes to the same conclusion by examining his copilot and stewardess' personal effects. He tells Hattie the truth about his wife. She is initially upset as she did not know he was married, but Rayford convinces her to be brave and to help calm the passengers down until they can safely land. Chloe climbs to the top of a bridge, intending to jump off it and end her life, when she gets a call from Buck, who is in the cockpit with Rayford. Rayford explains to Chloe all the New York area airports are closed and the streets full, and he is low on fuel and has nowhere to land. Chloe finds an abandoned Ford truck and uses it to clear away the equipment from a bridge under construction in order to create a makeshift runway. She uses her compass app and tells Rayford the coordinates of the landing site. Rayford is able to glide to a rough landing, saving the passengers, who leave the plane only to see the world aflame. Buck mentions that it looks like the end of the world, while Chloe informs him that it is just the beginning. Major Dodson as Rayford "Raymie" Steele, Jr.
On August 7, 2008, Cloud Ten Pictures announced that it had entered into a settlement agreement resolving the two lawsuits against it and Namesake Entertainment, which co-produced the original trilogy. The suit was filed by Tim LaHaye. The settlement ended a legal dispute over the Left Behind film rights that began in 2000. On October 1, 2010, Cloud Ten again reacquired rights to the film. Cloud Ten announced that they were rebooting the Left Behind film series. It was in the news that they planned on making the remake of the big-budgeted theatrically released film series based on the novel Left Behind. On October 31, 2011, it was reported that Paul LaLonde and John Patus, who worked on World at War together, had written a screenplay for the reboot. On October 19, 2012, it was reported in The Hollywood Reporter that stunt artist Vic Armstrong was set to direct the reboot film with the budget around $15 million. On October 19, 2012, The Hollywood Reporter reported that Nicolas Cage was in talks to join the cast as a lead actor. He portrays the lead role of Rayford Steele in the film. In December 2012, it was reported that Chad Michael Murray was in talks to join the cast, to play the role of journalist Cameron "Buck" Williams. On January 3, 2013, Ashley Tisdale joined to play the role of Chloe Steele in the film. In March 2013, Tia Mowry was in talks to join the cast of the film; later she joined. It was announced on August 9 that Tisdale dropped out due to scheduling conflicts. At that time, it was also announced that Jordin Sparks had signed on to join the cast. Sparks' character is named Shasta. On August 13, Cassi Thomson joined the lead cast, replacing Tisdale as Chloe Steele. On August 19, 2013, Olympic bobsledder and hurdler Lolo Jones was announced as a cast member, portraying an airport gate attendant. On September 9, 2013, Lea Thompson was announced to portray Rayford Steele's wife, Irene. The character Nicolae Carpathia does not appear in the film. Principal photography began on August 9, 2013 in Baton Rouge, Louisiana. The film was theatrically released on October 3, 2014 in the United States via Stoney Lake Entertainment. The film was universally panned by critics and audiences alike. On Rotten Tomatoes, the film has an approval rating of 1% based on 67 reviews, with an average rating of 2.1/10. The site's critical consensus reads, "Yea verily, like unto a plague of locusts, Left Behind hath begat a further scourge of devastation upon Nicolas Cage's once-proud filmography." On Metacritic, the film has a score of 12 out of 100, based on 25 critics, indicating "overwhelming dislike". Audiences polled by CinemaScore gave the film an average grade of "B–" on an A+ to F scale. In a review for Entertainment Weekly, film critic Lindsey Bahr writes, "At best, Left Behind is shoddily made sensationalist propaganda—with atrocious acting—that barely registers as entertainment. At worst, it's profoundly moronic. Audiences, Christian or not, deserve better, and it's hard to imagine that the ham-fisted revelations in this schlock could serve any higher purpose." Richard Roeper gave the film a grade of D−, stating that "the writing is horrible, the direction is clunky, the special effects are not special [and] the acting is so wooden you could make a basketball court out of it. Everything about this film feels forced and overwrought. With all due respect: Oh. My. God." On her ½ star review of the film, Linda Barnard from the Toronto Star writes, "The tantalizing prospect that this could have been a camp set-up of the Snakes on a Plane or Sharknado ilk pops up as Left Behind starts to echo 1970s flight deck-driven disaster films—and the parodies that followed. No such luck. Armstrong appears humourlessly earnest about his task. Score one for Satan." Christian film critics were critical of Left Behind. Paul Chambers from MovieChambers.com begins his scathing review with, "There are millions of Christians with average or above-average intelligence. I'd like to think that I'm one of them. So, what possessed the makers of Left Behind to produce such an ignorant piece of garbage that's easily one of the worst films of 2014, if not all-time?" Christian magazine Christianity Today heavily criticized the film, saying, "Left Behind is not a Christian movie, whatever 'Christian Movie' could even possibly mean. In fact, most Christians within the world of the movie—whether the street-preacher lady at the airport or Rayford Steele's wife—are portrayed as insistent, crazy, delusional, or at the very least just really annoying. They want churches to book whole theaters and take their congregations, want it to be a Youth Group event, want magazines like this one to publish Discussion Questions at the end of their reviews—want the system to churn away, all the while netting them cash, without ever having to have cared a shred about actual Christian belief. They want to trick you into caring about the movie. Don't." They also stated that they "tried to give the film zero stars, but our tech system won't allow it." However, the film was praised by Tim LaHaye and Jerry Jenkins, the original authors of the Left Behind series. Neither liked the 2000 version and LaHaye filed suit against it for breach of contract. After watching an early screening of the film, LaHaye said, "It is the best movie I have ever seen on the rapture", while Jenkins said, "I believe it does justice to the novel and will renew interest in the entire series." When asked if it was good, Jenkins said, "It's better than good." Left Behind played on 1,825 screens on its opening weekend, taking the number six position at the US box office with $6,300,147. The film gained 62 screens the following weekend, but posted a decline of 55% to end with $2,834,919. The third weekend saw the film dip to 923 screens and posted a 67.5% drop to $922,618. Its fourth weekend was the biggest drop yet for the movie at 71%, but rebounded in the later weeks. The final two weekends of the film's US theatrical release, however, posted a robust 265% increase before ending its run on December 11, 2014. It also debuted in Singapore and Russia on the same day as its US run (October 3), with the former grossing $101,585 from 13 screens and the latter grossing $620,636 from 470 screens. The following week, the film opened in three additional countries: Lebanon ($63,585 opening week) on October 8, and Malaysia ($303,833 opening week) and Philippines ($259,303 opening week) on October 9. All three countries had the highest debuts in the top three, with the countries of Lebanon and Philippines had the film ranked second place on their Box Office Chart. The film opened in two more countries the following week. The film ranked eighth place in Taiwan and came in second place in the United Arab Emirates with $336,544 from 47 screens. Egypt and Brazil soon followed on October 22 and 23, taking in $24,951 and $633,096 respectively. Brazil is the first country to actually post a second-week increase (but only a scant +0.2% increase) and retaining its fifth place spot, making $634,150 (from 232 screens) for a total of $1,591,847. The film dropped 41% in its third week to end the weekend with $373,034 and a total of $2,221,533. The movie debuted in South Africa on December 4, 2014, ranking 11th place with a total of $14,424. The movie opened in Ecuador on April 17, 2015, debuting in 7th place with $15,055 from 11 screens. The movie dropped 6% the second week, earning $14,156 from 12 screens. However, its third week suffered a massive -88% decline, ending the weekend with $1,673 from 6 screens. The film has grossed $45,652. The film was released in Italy on July 29, 2015 and took the no. 3 position with $309,832. In its second weekend, the film dropped two spots to number five with $164,047 (a decline of 47%). The third week saw a decline of only 18% but retained its fifth place spot to end the weekend with 134,186. The film fell out of the top 10 beginning in its fourth week, as it ended the week $23,627 (resulting in a steep 82% drop). The film dropped to number 14 in its fifth week with $15,326. The sixth week saw a drop to the 16th position, but saw a steady 32% increase to end the week with $21,026. The seventh and final week saw only a scant 3% fall to end the week with $20,414. Its seven-week cumulative total stands at $1,048,328. As of March 4, 2016, the film closed and had grossed $14,019,924 domestically and $13,385,972 overseas for a worldwide total of $27,405,896. Left Behind was nominated for three Razzies at the 35th Golden Raspberry Awards, for Worst Picture, Worst Screenplay, and Worst Actor for Nicolas Cage. It lost in all three categories to Saving Christmas, starring Kirk Cameron, who coincidentally starred in the original Left Behind film franchise. Left Behind was released via DVD and Blu-ray Disc on January 6, 2015. According to LaLonde, two sequels were planned, with Thomson, Murray, and Whelan all signed on to reprise their roles. On April 7, 2015, Paul LaLonde launched an Indiegogo crowdfunding campaign, asking for $500,000 in contributions. The campaign raised $80,699 after a month. If the goal had been met, LaLonde would have begun filming in August 2015 for a summer 2016 theatrical release. On July 22, Paul LaLonde announced on his Facebook page that the crowdfunding campaign has resumed "on their own platform". Another film, developed by Tim LaHaye's grandson, Randy LaHaye, titled Vanished – Left Behind: Next Generation was released September 28, 2016. The film is intended to be the start of a new, contemporary film series drawing inspiration from The Twilight Saga film series, being marketed for a younger audience. The film pulls plot-points from the Left Behind spin-off series titled, Left Behind: The Kids. The film received mixed reviews, but was well received by the book series' author. There are reportedly sequels in development. On July 2, 2017, Paul LaLonde announced on the film's Facebook page that he has purchased the rights to all 16 books of the series. He explains that he has always been "handicapped" to the first two books in the series and will now finally tell the story in its entirety. He is currently planning a 6 to 8 film series that will cover the books in its entirety. It was revealed in January 2 that the series will now consist of seven films and the first of the new films will be an adaptation of the third book, Nicolae: The Rise of Antichrist, though it's not known whether there will be a new cast or Cage, Whelan, Thompson, and Murray will return. On March 9th, 2019 at Cleveland Wizard Con, Chad Michael Murray stated in a Q&A that a script was in the works and he had been contacted about possible future filming dates, but nothing has been set in stone. ^ a b c McNary, Dave (March 28, 2014). "Nicolas Cage's 'Left Behind' Set for Oct. 3 Release". variety.com. Retrieved March 29, 2014. ^ "LEFT BEHIND (15)". British Board of Film Classification. December 19, 2014. Retrieved December 19, 2014. ^ "FACT SHEET". Left Behind Movie - Starring Nicolas Cage - In Theaters October 3, 2014. Retrieved October 2, 2014. ^ a b c "Left Behind (2014)". Box Office Mojo. Retrieved December 28, 2017. ^ a b "Stunt Icon Vic Armstrong to Direct Nicolas Cage in 'Left Behind'". hollywoodreporter.com. October 19, 2012. Retrieved August 6, 2013. ^ a b "Nicolas Cage in Talks to Star in 'Left Behind' Reboot". hollywoodreporter.com. October 19, 2012. Retrieved August 6, 2013. ^ a b "Chad Michael Murray In Talks For 'Left Behind'". deadline.com. December 22, 2012. Retrieved August 6, 2013. ^ a b "Cassi Thomson Replaces Ashley Tisdale in Nicolas Cage Pic 'Left Behind'". variety.com. August 13, 2013. Retrieved August 14, 2013. ^ "Cloud Ten Pictures announces settlement of legal disputes with Timothy LaHaye, co-author of Left Behind book series". christianfilmnews.com. August 7, 2008. Retrieved August 6, 2013. ^ "Cloud Ten Pictures to Remake Left Behind". christiancinema.com. October 13, 2010. Retrieved August 6, 2013. ^ "Cloud Ten Plans for Bigger, Better 'Left Behind'". christianpost.com. November 24, 2010. Retrieved August 6, 2013. ^ "Faith-Based 'Left Behind' Books Returning to Big Screen". hollywoodreporter.com. October 31, 2011. Retrieved August 6, 2013. ^ "Nicolas Cage in talks to star in 'Left Behind' reboot". variety.com. October 19, 2012. Retrieved August 6, 2013. ^ "Chad Michael Murray Will Be Left Behind". empireonline.com. December 22, 2012. Retrieved August 6, 2013. ^ "Ashley Tisdale joins Nicolas Cage movie 'Left Behind'". digitalspy.co.uk. June 4, 2013. Retrieved August 6, 2013. ^ "Ashley Tisdale Joins 'Left Behind'". deadline.com. June 3, 2013. Retrieved August 6, 2013. ^ "Has Tia Mowry-Hardrict Landed Major Role In Blockbuster Film Franchise?". elev8.com. March 25, 2013. Retrieved August 6, 2013. ^ "Left Behind - Timeline Photos - Facebook". Retrieved October 2, 2014. ^ "Lolo Jones lands role in 'Left Behind' movie starring Nicolas Cage". nbcsports.com. August 19, 2013. Retrieved August 20, 2013. ^ "Lea Thompson Role". hollywoodreporter.com. September 9, 2013. Retrieved September 9, 2013. ^ "FAQ Left Behind Movie". Archived from the original on November 2, 2013. Retrieved October 31, 2013. ^ "Filming in Louisiana: Nicolas Cage's 'Left Behind' prepping in B.R., plus full local production listings". nola.com. July 24, 2013. Retrieved August 6, 2013. ^ "Nicolas Cage to shoot movie in BR". theadvocate.com. August 2, 2013. Archived from the original on August 11, 2013. Retrieved August 6, 2013. ^ "Left Behind". Rotten Tomatoes. Retrieved November 10, 2014. ^ "Left Behind Reviews". Metacritic. Retrieved October 9, 2014. ^ "Left Behind – CinemaScore". CinemaScore. Retrieved July 15, 2017. ^ Bahr, Lindsey (October 2, 2014). "Left Behind". Entertainment Weekly. Retrieved October 2, 2014. ^ Roeper, Richard. "Left Behind". RichardRoeper.com. Retrieved October 3, 2014. ^ Barnard, Linda (October 2, 2014). "Tusk, Kite and Left Behind". Toronto Star. Retrieved October 9, 2014. ^ Chambers, Paul (October 3, 2014). "Movie Review: Left Behind". Retrieved October 22, 2014. ^ "Left Behind". Christianity Today. Retrieved October 3, 2014. ^ ""Left Behind" author LaHaye sues "Left Behind—The Movie" producers". Christian Film News. May 18, 2001. Retrieved February 17, 2015. ^ "Left Behind, Starring Nicolas Cage, to Open in Theaters on October 3". Comingsoon.net. February 17, 2015. Retrieved October 3, 2014. ^ "Original Authors Loved the New 'Left Behind' Remake". Relevant Magazine. Retrieved February 17, 2015. ^ "RAZZIES® Celebrate 35 Years of Worst Achievements in Film with Inclusive Nominee List...and New "Redeemer" Award". Golden Raspberry Awards. Retrieved January 14, 2015. ^ Strowbridge, C. S. (January 5, 2015). "DVD and Blu-ray Releases for January 6th, 2015". The Numbers. Retrieved January 10, 2015. ^ "Left Behind 2". Indiegogo.